In the store, most boots will be branded like NASCAR with hangtags and stickers highlighting all the bells and whistles of why it's better then the next one on the shelf. While these may seem like a bunch of wasted paper at first, they are important. Yes, you will most likely find the elegant, charming story of the brand itself but you should also find all the features and technologies within that footwear style. Since additional features increase the cost of the boot, most brands will be sure to let you know why a boot cost what it does, thus clearly indicating what's in it. If you are in a store that displays the box with the boot, some brands also include a helpful label somewhere on the outside or inside lid listing all the encompassing technologies. It's helpful to shop at a store that has a large selection for easy comparison. If you're shopping online – and research shows that around 78% of people have bought something online1 – then you'll need to pay attention to the description and technology text of each individual product. Reputable sites are full of quality information – and to be honest, if a site is a little lack in this area; it's probably not one from which to make your purchase. Just like a store, a site with a large selection for easy comparison is extremely useful and convenient. That's one of the reasons Lehigh CustomFit sites are so successful. And with continuous Free Shipping and Returns, the excuse about not knowing what size to order before trying it on is no longer relevant. This has become a powerful tool for a lot of online shoppers. It may not be an obvious place to look for boot specifications but it can be useful to know if what a brand claims about its product is actually true. For example, a boot may be labeled waterproof but many previous purchasers are stating that water does get in. It's helpful to line up the claimed technology with user experience. In meeting the OSHA standard for protective toe footwear (29 CFR 1910.136(a)) the product must comply with ASTM (American Society for Testing and Materials) test methods. All footwear built to ASTM specifications must be labeled with appropriate safety feature marks on the inside or outside surface of the tongue, gusset, shaft or quarter lining in a 4-line format located inside a rectangle box. This is basically your cheat sheet for the main features of the boot. You've probably seen it when you're looking for the size of the shoe but maybe didn't know what all the marks or symbols meant. Below is what a sample tongue label in a safety toe boot might look like. Depending on the brand or manufacturer, it can vary with elements in different locations but all safety toe footwear will have the rectangle. Labels for non-safety toe boots will have an oval. At the top may be the brand logo with the model or style number and production date underneath it. Production date can be handy if you're wondering how old the boots are or have been sitting on the shelf or in the warehouse. If it includes a description this will be where waterproof and insulation will be listed if the boot has it. Directly beneath that is the rectangle box with the required ASTM markings in a 3 or 4 line format. This line identifies the ASTM standard. In this case the components meet or exceed the most recent revision of the protective or safety toe cap footwear performance requirements of ASTM F2413 issued in 2011. 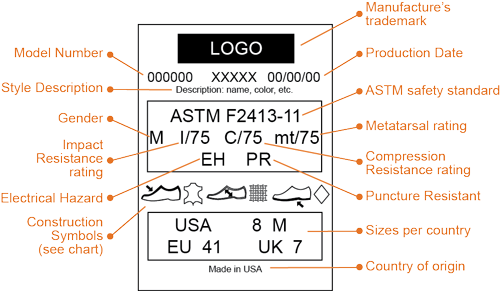 Directly below the ASTM ratings will be a row of symbols representing materials used in the construction of the boot. On the actual boot they can sometimes be rather small and hard to make out. Here is what each represents. So, in the label sample above it shows the UPPER symbol followed by the LEATHER symbol meaning that the upper is constructed of leather. Following that is the LINING symbol and then the TEXTILE symbol telling you that the lining is made of a textile. The last two symbols are the OUTSOLE and OTHER MATERIALS indicating the outsole is made of a material other than leather or textile. The rectangle box below these symbols is where you will find your shoe size. Some manufacturers will include other country standards as well as the US. Obviously use what is most helpful and relevant to you. The country of origin is the last piece of information on the label and this basically tells you where the shoe was manufactured. It’s important to know what you’re buying, what you’re paying for, and that you are getting exactly what you need to do your job well, and above all, stay safe. We hope the above helps you be a more informed shopper. If you have any questions about the content of any product on our sites, we encourage you to Ask The Expert or contact one of our experienced fit specialist. Class C/75 footwear retains a clearance of .500 inch after compression of 2500 lbs. or greater. Class Mt/75 footwear retains a clearance of 1.0 inch for men’s and .468 inch for women’s or greater after a nominal impact of 75 foot pounds (50 lb. weight dropped from 23.25 inches reaching 117.9 ± 2.4 inches per second velocity at impacting at 3.5 inches from the toe of the footwear for men’s and at 3.375 inches from the toe of the footwear for women’s). To meet ASTM standard, SD constructed or manufactured footwear will provide for electrical resistance of between 106 and 108 ohms. 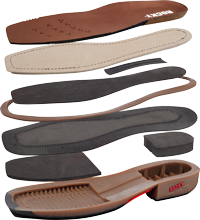 To meet ASTM standard, PR constructed or manufactured footwear outsole and heel area is capable of withstanding a minimum puncture resistance of 270 lbs and must show no signs of cracking after 1.5 million flexes.